Hustle is a book co-written by entrepreneur digital marketing extraordinaire Neil Patel, the founder of Kissmetrics and Crazy Egg. If you're not familiar with Neil, he's made a big name for himself online in the marketing world with thousands of blog posts, hundreds of YouTube videos, several website businesses, keynote speeches, and consulting work for major corporations. You could say that he's a younger and more technical Gary Vaynerchuk, just with less obscenities. He's been a big inspiration for me as an entrepreneur and digital marketer over the last couple years so I was excited to read his eBook. His New York Times best-selling book "Hustle" is very different from his blog and video content. His writing and new video content is usually very technical, especially when it comes to search engine optimization and social media marketing tactics. This book however was much more about the big picture and lessons learned from himself and the two other co-authors during their business ventures. It talked about the authors' upbringings and how they deviated from the beaten path by becoming successful entrepreneurs. The book is also pretty generic and doesn't get into the nitty gritty of how Neil built his businesses at a young age, lost a million dollars, and experimented with countless SEO and digital marketing tactics to make it to the top. The lessons learned in the book are pretty obvious and generic too. Overall though I still liked the positive message, strong points, and even the lame alliteration (I'm big into that as well). It just wasn't much of an exciting page turner. I wasn't exactly sure what to expect from "Hustle" but I thought it would be a little more similar to his blog, podcast, and video content. I don't think I'm alone in feeling this way and I think he'll eventually publish a more strategic marketing book in the next year or two. His marketing advice has helped thousands (if not millions) of people and I think a book more in his wheelhouse will get a better reception. The only problem is that digital marketing changes every month and that books on this topic can become outdated or even obsolete in a couple years. 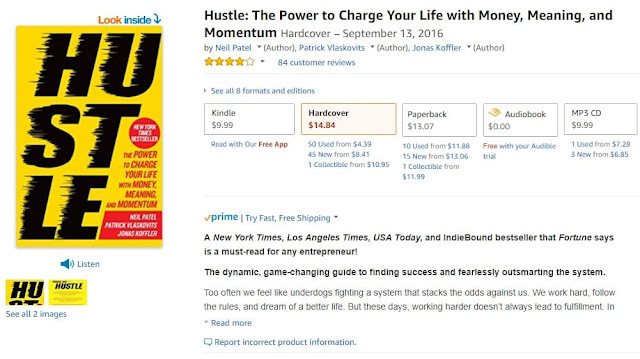 "Hustle" is the right title for the book indeed. In a recent YouTube video and marketing podcast he even discussed that he had to provide corporations with free consulting, social media management, and speaking engagements in return for them purchasing hundreds or thousands of his books to put him on the New York Time's bestseller list. Although in that video he does make the accurate case that the NYT list can be biased, using several questionable tactics to get his book on the list is quite the "hustle" indeed. It fits in well with his track record of hustling to manipulate Google search rankings and building up his personal brand with some blowfish tactics. All of this I actually respect, but in this case it inflated a book that may not have been worthy of NYT Best-Seller status. Overall it's certainly not a bad book, but not the best business book out there. You might be better off sticking to his free blog and video content. I hope you enjoyed this book review of Neil Patel's "Hustle". Interested in more business book reviews?